Russian citizens can find out which officials and politicians keep their promises and which do not. A number of specialized websites are monitoring how promises are kept amongst Russia’s statesmen. There are several sites on the Russian Internet where users can verify whether the president, the prime minister, government ministers, parliament deputies and other public personages are keeping their promises or not. These sites, which are essentially electronic indicators of honesty, can be useful both for voters (to understand who is as good as his word and who is not) and for politicians (to help them remember their promises). This service monitors the promises and prognoses of national leaders, parliamentary deputies, opposition leaders and even showbiz celebrities. Interestingly, there is a separate page devoted to Vladimir Putin’s promises. The site recalls, for example, that Putin never kept his promise to cut the value-added tax rate. Putin made the promise back in 2004; but, eight years later, the rate is still at 18 percent. Users are also reminded that Putin’s famous promise to double the GDP within ten years will hit its deadline next year – that promise was made in 2003. Promises are broken not only by the authorities, but also by members of the opposition. Furthermore, A Just Russia party member Gennady Gudkov has yet to keep his promise to challenge the decision authorities made to strip him of his parliamentary mandate. Weeks have passed since the decision was handed down and no law suit has been filed by the politician. Another convenient section of the website keeps a list of red-alert promises whose deadlines are quickly approaching. Currently, for example, Duma Deputy Nikolai Valuyev has yet to keep his promise to organize collection of waste paper at the State Duma, and President Putin has yet to deliver on his promise to provide housing for all those who were left homeless in Krymsk by Nov. 15. On this website, users can look up exactly what was promised and when it was promised. More importantly, users can track promises that are specifically important to them. When users add a promise to the system, a tracking mechanism is switched on and a separate page stores all the news connected to that topic. The largest numbers of promises on the site have been made by Vladimir Putin (168) and Dmitry Medvedev (63). Whether or not a promise has been kept is also determined by users, through voting. For example, Putin’s promise that State Duma and presidential elections would be fair is marked as unfulfilled, while his promise that “no fees will be charged for amateur fishing” is marked as fulfilled. Users can vote immediately on Dmitry Medvedev’s promise to combat the phenomenon of “Potemkin villages.” This is the Russian expression that refers to attempts of local authorities to make token improvements before an inspection. Last April, Medvedev said he would fight this “window dressing” by unexpectedly changing the routes he uses to check the conditions of neighborhood courtyards and building entrances. He has been given a year to fulfill this promise. The Pravdometr site is an index that measures the honesty of public personalities. It makes it possible for all users to collectively assess whether promises of public figures are sincere and realistic. The idea is sound, but there have been problems with its implementation. The ratings for those who tell the truth and those who cheat appear very subjective, since any authorized user can contribute to the site. 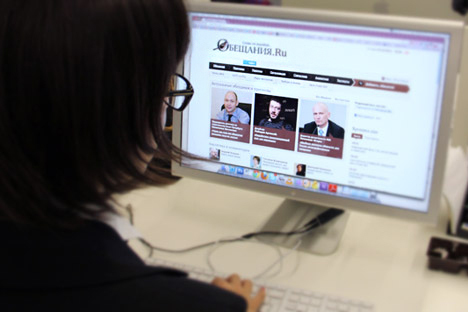 The site is also too cautious in its assessments: the “truth tellers” list is headed by President Putin, while the list of “liars” includes mostly regional officials. For example, city official Boris Murashov is on the latter list, presumably for once giving a rash promise that traffic in St. Petersburg would never again come to a standstill due to severe snow. The site is currently monitoring Putin’s promise that “real snow will be guaranteed” during the 2014 Sochi Olympics, along with his promise that the Sayano-Shushenskaya Hydroelectric Power Plant will be fully operational in 2013. Medvedev’s promises include raising labor pensions by 45 percent, beginning in 2015. When the time comes, internet users will decide whether the prime minister has kept his word. Of course, this will happen provided the site does not fade away by that time, as it has been poorly updated of late. First publihed in Russian in Moskovskiye Novosti.